Eww, it's been that time of the year again. Everyone around me is sick! My hubby, in particular has been sick more often than not this current cough, cold, and flu season. I had great tips for him but you all know how husbands are, they don't always listen, even if it's in their best interest. At least I had Vicks® DayQuil™ and NyQuil™ Severe to help abate the symptoms and function as normally as we could. Read on to find our 5 Tips for the Cough, Cold and Flu season. As you may know, the flu season has been bad the last couple of years. Immunization is great but immunizations try to predict and cover for the most likely strain of flu for that year. Predictions aren't always correct and as a result, we've had more flu than ever the last couple of years on top of the regular cough and colds. Like I mentioned earlier, my hubby has been getting sick every couple of weeks, it seems and it always lasts him forever. In hopes of cutting his course shorter, I picked up some Vicks® DayQuil™ and NyQuil™ Severe to help. The formulation Vicks Vicks® DayQuil™ and NyQuil™ Severe are quite similar. They both have 325mg of Tylenol, Cough syrup, and phenylephrine (decongestant). The only difference is that the day time has Guaifenesin (an expectorant, which helps to clear mucus out) and the night time has Doxylamine, which is an older antihistamine so it's more prone to make you drowsy (effectively, helping you to get a good night's rest and allowing your body to heal). 1) Hand Hygiene -I can't emphasize enough how important it is to wash your hands. Often colds are transmitted through viruses and germs. How do we get them? We spread them to each other whether we mean to or not. Reduce transmission by making sure you wash your hands with soap and water or remember to use hand sanitizer. 2) Adequate rest -Getting enough rest is one of the keys to maintaining our body's immune system and health. Lack of sleep leads to a weakened immune system and makes us more susceptible to getting sick. 3) Consider wearing a mask -I know, masks are uncomfortable but if you're hacking all the time or someone around you is. There's nothing like a mask for preventing others from inhaling the bugs. 4) Hold off from sharing -Sharing is caring, we all know that. However, if you're sick, avoid sharing your food, beverages, and so on. Your friends and family will thank you later. 5) Immunizations -We all have our own opinions on this one. I get immunized every year with the flu shot. Keep in mind that being immunized only helps against the strain you're immunized against. It doesn't mean you can't get sick with other strains or viruses. 6) Have a game plan when you're sick - I stock up on cough/cold/flu supplies so that it's all available when someone gets sick. This year, Walmart was my place to go. Cough drops were amazingly cheap. Plus, I needed something like Vicks® DayQuil™ and NyQuil™ Severe to make it through my days and nights at work. 7) Stay hydrated -If you're feeling crappy, it's sometimes hard to want to eat or drink fluids but staying hydrated is an important part of getting better. 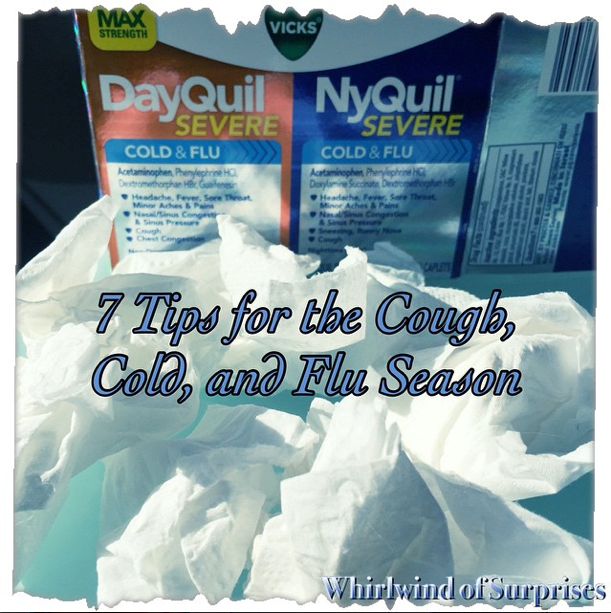 What do you do to stay healthy during the cough, cold, and flu season? Don't miss out on our many other posts with great tips for your health, beauty and skincare, travel, and more.